Extremely common in our English woodlands, the Blushing Bracket (Daedaleopsis confragosa) is often found on the dead wood of Willow trees but also on many kinds of deciduous trees. The semi-circular or fan shaped brackets, often in grouped tiers, can grow up to 15cm across. The upper surface shows distinctive radiating ‘bands’ and has a wrinckled surface texture (smoother when young). They are often thicker at the point of attachment to the wood (up to 5cm) and the margin remains thin and undulating. As an ‘all year round’ fungus, like a lot of bracket fungi, it’s colour changes dramatically throughout it’s lifetime. When young to middle-aged they are white or have a white-pinkish tinge. They age to a much darker reddish/brown and become a lot tougher and ‘corky’ in consistency. When younger and more fresh, a little test on the underside can reveal their identity. The white(ish) pores are quite large and are a mix of elongated slots and round holes. Rubbing these with your finger you will see them readily bruise (or should I say ‘blush’) pinkish/red. This is unique to this bracket alone. When they are very young and quite small I often think they may be something new I haven’t seen before, but over time I have realised that the ‘tickled pink’ test will tell me what it is straight away. It’s always good to have an ‘in the field’ test under your belt. The Blushing Bracket (Daedaleopsis confragosa) turns a deep red/brown as it ages. Notice the Pinkish/Red bruising on the pores (top-right). This is how it got it’s common name. Up to 20cm diametre / 1.5-5cm thick. Semi-circular or fan shaped. Thin margin. Wrinkled and radially ridged. Found singularly or in tiered groups. White/Pink when young then brown/reddish when old. Large round and elongated pores. On dead deciduous wood, esp. Willow. Very common. All year. Inedible. Tough and very bitter. It’s very rare that I do not see one of these bracket fungus when I’m out and about on a forage. They grow quite large and are around all year. It would be hard to miss one. The Birch Polypore or Razorstrop fungus (Piptoporus betulinus) is an extremely common polypore fungus. As the name suggests, it is found exclusively on birch trees. At maturity they are typically semicircular or kidney shaped as they grow outwards from the tree body. Shapes and sizes may differ a little but generally this is the norm. As I mentioned earlier, they can grow to a good size – between 20 – 30cm across and 8cm thick! They’re quite a sight to behold when they get to this size. The colour is that of pure white (when younger) and as it matures it changes to a dull grey or tawny brown. It’s smooth surface often cracks, showing white flesh underneath. The consistency is spongy or slightly rubbery to the touch. These fruiting bodies can usually last from one year into the next, that is why you can see them all of the time over the winter months. On the underside the pored surface is smooth and pure white, but over time this gets marked with dark patches from age and/or insect attack. I know what you’re thinking though. Is this fungus edible? Well, unfortunately not. It actually smells quite pleasant but it’s taste is quite bitter. It’s a shame, I know. At least it had it’s uses even as far back as 5,300 years ago! In 1991 “Ötzi the Iceman” (Europe’s oldest natural human mummy) was discovered by German tourists in the Alps. 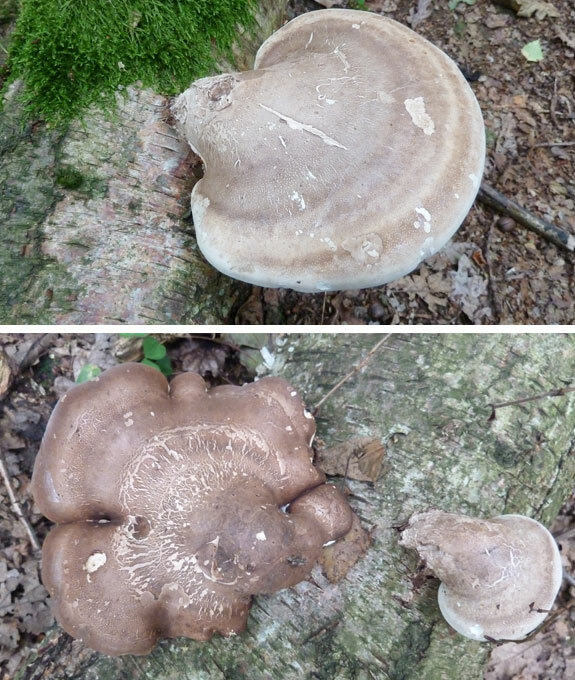 Found in his possession were two species of polypore mushroom. One of which was the Birch Polypore (for medicinal use) which is known to have antibacterial properties. It could have also have been used to sharpen blades or tools – hence the name ‘Razorstrop’. In the images above are some very young Birch Polypores growing out of from the bark of a fallen silver birch tree.